Air conditioning system for apartments. Channel air conditioning for apartments. Air conditioning in the apartment is the process of maintaining a comfortable microclimate and temperature indoors. The notion favorable atmosphere in an apartment includes such aspects as convenient temperature, optimal air velocity and the necessary humidity level. From the very beginning I want to point out that you should not confuse air conditioning and ventilation.Each of these systems has its own purpose. The main responsibility of ventilation is to provide air exchange in the room, supply of fresh and clean air, saturated with oxygen. Such atmosphere in your apartment has a beneficial effect on the general condition of the body, increases energy level and makes you feel more awake, sleep becomes stronger and you feel better in the morning. КAir conditioning, in its turn, is aimed at maintaining a comfortable temperature in the apartment. On hot days it helps to cool down, in the offseason it pleasantly warms up the apartment. What is air conditioning in the apartment? Most of us will immediately think about the split-system, when one outdoor unit and one internal wall-mounted unit are installed in the apartment. In fact, there are much more options for implementation of this engineering system in the apartment. It all depends on the number of rooms, their purpose, the number of residents and personal preferences. 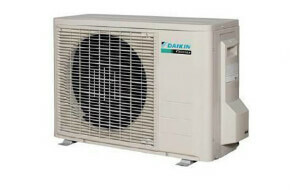 Premium class system presents air conditioning system with the internal units of the channel (also known as duct) type. and any other types of devices that do not require the air ducts and additional materials such as air distribution grilles, throttle valves, sound insulation, etc. Let’s analyze on examples what options we have when we speak about air conditioning with wall-mounted indoor units. 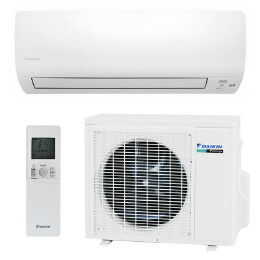 In this case air conditioning can be presented with split-system, multi-split system and multi-zone system. Fig. 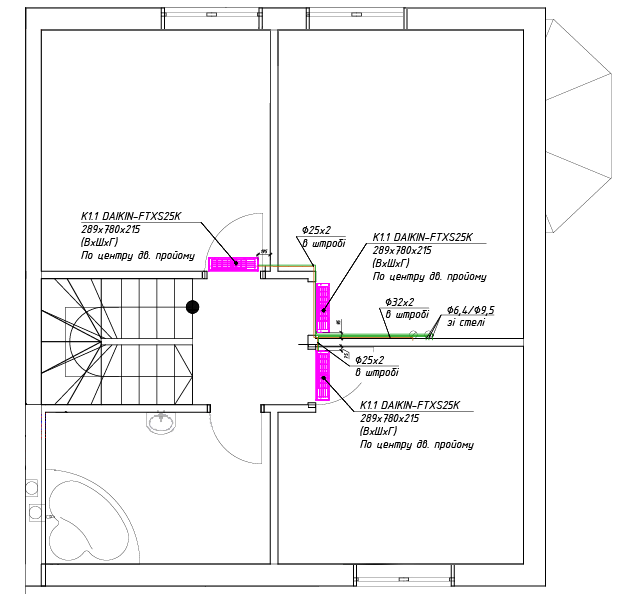 3 – Project of implementation of a multi-zone air-conditioning system in the apartment. 3. VRV-system outdoor unit – RXYSQ10TY1. In most cases, such system is used in large buildings, where the outdoor unit is located on the roof or in the basement and internal units are connected to it with integrated piping system. 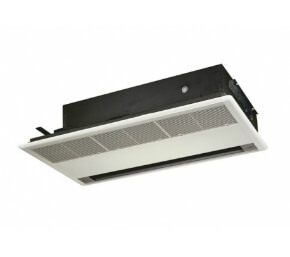 Indoor units can be either wall-mounted, cassette-type or sub-ceiling. The main condition is that the power of the outdoor unit could supply all internal ones. The channel-type split system includes the unit itself, air ducts, an insulator for ducts (to prevent condensation), a gate valve for adjusting the system, plenum boxes, adapters, designing. Air distribution grilles or diffusers are designed so that air flows are not directed to the resting or working areas in the apartment. From the point of view of design, they look very nice, all devices are located in the sub-ceiling space and are sewn up with plasterboard. And the grilles and diffusers are located above the windows where the air velocity is lower for moving the air inside the room. Fig. 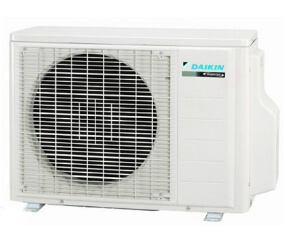 4 – Model of channel air conditioning in an apartment based on Daikin equipment. 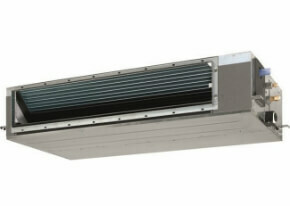 The channel or duct air conditioning system comes in two types: low-pressure and medium-pressure. Both are used in houses and apartments. All indoor units of channel type system are located in the technical room (bathroom, dressing room, pantry, corridor). For maintenance of these units, there are access panels that simplify service of filtering elements, electronics, and the inner block itself. There is a misconception that by installing one air conditioner in one room, you solve the problem with cooling the entire apartment. And it is definitely a false notion and that is why. First of all, any air conditioning system should work zonally. For instance: we have two rooms, but the air conditioner was placed in only one of them, thinking that it would work for cooling down the second room too. In a situation when a conditioner works only in one room, we do not take into account the temperature sensors within the system. They are programmed for the certain area, so while adjusting the desired temperature inside the room, they either turn off the compressor or minimize the speed (if it is an inverter air conditioner, the compressor switches from 100% to 10% operation mode). •	when one of the family members is ill, he needs his own zone of comfort and rest during the day and even at night and consequently, this person also needs to be in his comfortable microclimate. Taking into account these points, it becomes clear that one air conditioner cools only one zone and cannot satisfy all the individual needs. Secondly, in the air conditioning project of an apartment or a house, we carry out detailed calculations which include the identification and analysis of all possible heat gains. For example, heat gains from the outside (this is solar radiation, bearings, glazing) and hidden ones, which are indoors (these are heat gains from people in the room, home appliances, heating systems, etc.). Taking into account all these values, we select an air conditioner with the required power. This principle is applied to air conditioning systems of any type. For instance: why is it impossible to take one channel conditioner and cool 3 rooms all together? We have three rooms that face different sides of the world. Each has its area and its heat gain. All rooms are cooled by one indoor unit. The outdoor unit was picked up at the rate of 2 kW for each room, a total of 6 kW. The first moment – as mentioned above, we can never adjust the temperature separately in each room. This is possible only with the installation of a VAV TROX system, aimed at controlling the flow of air. This system opens and closes dampers. Thus, it becomes possible to supply the required amount of air to cool down this particular room. Each room has its own sensor. For example, the temperature is set at + 20 degrees. When the temperature reaches this value, the valve closes. At this time, the engine understands that it is necessary to make the air flow less in order not to create much pressure and no additional noise. This system is very expensive. Therefore, it is very important for apartment owners to properly implement air conditioning, focusing on heat gains in each room. This will save customers from installing a VAV TROX system and spending more money than needed. As a rule, it is only used in large office centers. The second mistake is not to take into account the differences between the zones of children’s and adults’ rooms. The third point – with this implementation, there will be a high level of noise from the unit, also high air flow and, consequently, bigger diameter of the ducts, and therefore more space for lowering the ceiling. All these moments lead to the inconvenience of a system design in terms of aerodynamics, noise characteristics, distribution of cold and energy consumption. When we have one channel indoor unit cooling its zone, there is no need to turn on a large unit. So, energy consumption will be three times less. -	wall-mounted internal units with a modern front panel. Such universal design of the device will fit into any room interior. The presence of a two-zone sensor determines the location of people and directs air flow away from them. In a sleep mode, the unit significantly reduces power consumption. -	the indoor unit of the wall-mounted air conditioner combines the most progressive technology and elegant design. This is the case when high performance is combined with almost silent operation in one device. 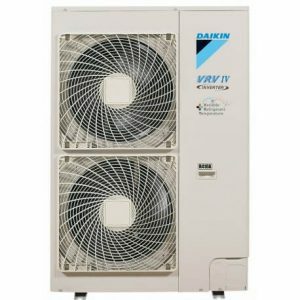 All you need – an intelligent control system, economical power consumption and a variety of additional functions – is provided by the manufacturers of these air conditioners. 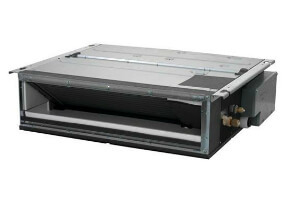 -	pertain to channel indoor units for inverter VRV systems. Indoor units of this type are convenient and practical. 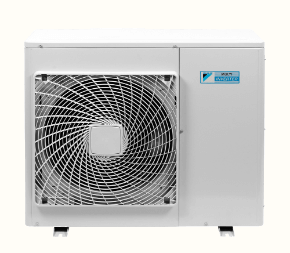 These devices work on freon R410A, which has good cooling performance and is environmentally friendly. The low level of pressure makes their work quiet – 27/27/30 dBa, respectively. -	medium-pressure channel type internal block. It has a special fan motor and drainage pump construction that’s why minimally consumes electricity. It is possible to control the air conditioner both with the help of a remote or wired control or through a centralized control system. -	internal cassette-type unit. It is very convenient because of compact dimensions, thanks to which it can be easily installed between the ceiling and slabs. Equipped with the function "No one is at home", which helps to reduce energy consumption. -	this internal channel-type unit has low noise characteristics – only 29 dBa. Belongs to medium-pressure air conditioners. It can be controlled both with the help of a remote and centralized control panel. -	outdoor unit of a multi-split system. Up to five indoor units can be connected to this installation. The device is equipped with a highly efficient compressor. It can be installed both on the outer wall of the building and on the roof, while maintaining the architectural integrity of the building. -	outdoor unit of a VRV system. It can be adjusted for limited power consumption. Up to 21 indoor units of different sizes and functions can be connected to the device. It is easy to install and maintain. 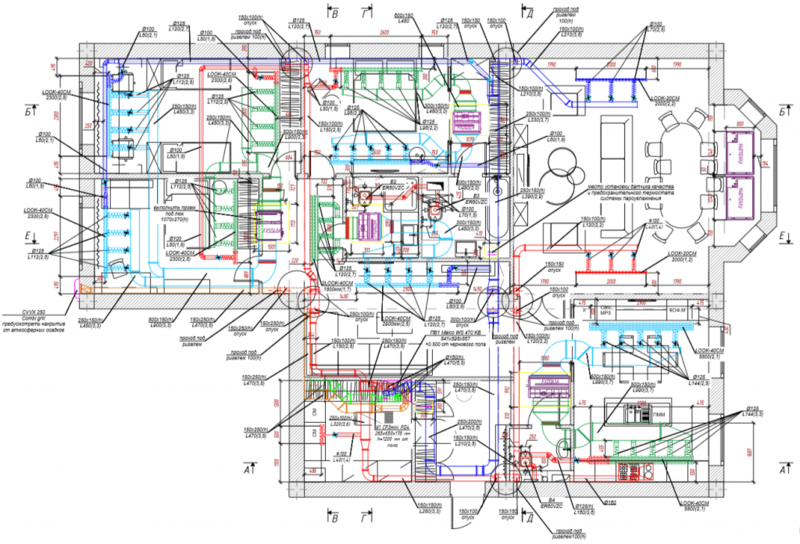 Implemented air conditioning project in a private house. 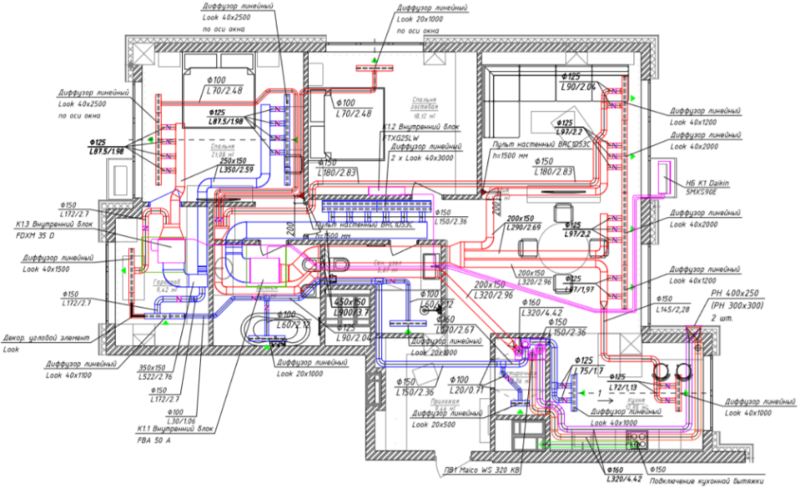 Overview of the house with ventilation, air conditioning and steam humidification systems. 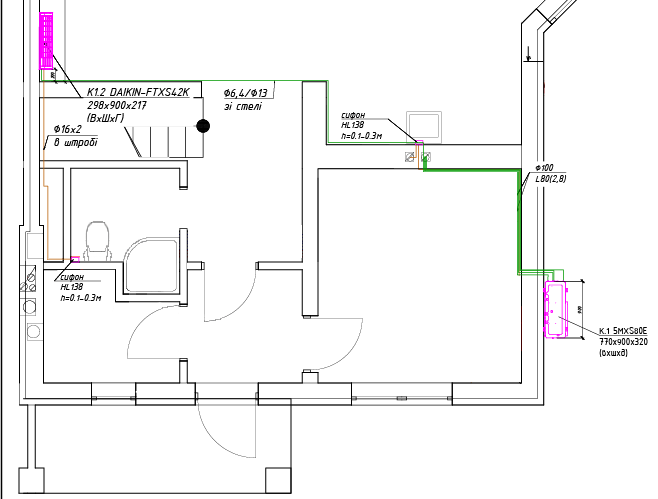 Implementation of ventilation and air conditioning systems in the apartment. Ventilation, air conditioning and steam humidification systems in the apartment. You come to the consultation and within an hour you get answers to all the questions related to the air conditioning system for your home. If you are happy with our vision, then you contribute a small sum to develop a commercial offer (CO). After approval of the draft commercial offer, you make an advance payment – 10% of the value of the draft CO.
Next step – we proceed to the project development*. Formation of final CO with adjustments after the development. The next stage is the payment for materials, equipment and installation work, minus 10% that were already paid. *Important! The design of the channel type air conditioning system is not included in the cost of the CO and is free for the client.